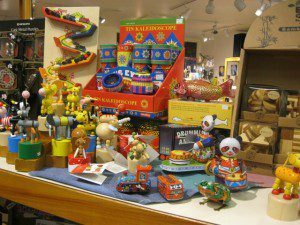 We have collectible tin toys that appeal to all ages, and our new selection of “retro” games has been a hit. Our 3-dimensional Puzzlemaster selection of brain teasers is ever-popular. “Love this store, awesome collection of old world toys and wooden gifts – amazed at the prices for such beautiful pieces!” Karyn Kraemer, Vancouver, B.C.